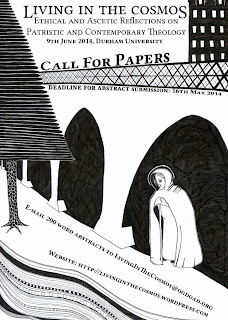 We invite the submission of abstracts for 20-minute long papers from all interested academics including a quota of one third postgraduate students for the day conference ‘Living in the Cosmos’, to take place at Durham University on Monday 9th June, 2014. This is a new conference and arises in response to a growing interest in the relevance of Patristic theology for contemporary living. Keynote papers will be 40 minutes and will open and close the conference. There will be of three sessions of four 20 minute papers over the course of the day. We are looking to accept twelve papers, four of which will be from postgraduate students. If interest is large enough and abstract contributions greatly exceed this number, we will consider putting on multiple sessions at a time. When doing so, please indicate your name and institution in the subject of the email and nowhere else on the abstract submission. Deadline for abstract submission is Friday 16th May 2014. Further notification will be issued when registration opens. A registration fee of £10 for students and £15 for non-students will apply, which includes lunch and afternoon refreshments. A limited amount of overnight accommodation will be available to book in advance in St Johns College and other University colleges. Please contact us as soon as possible if you wish to book a room. We will also be going out for a meal together in the evening and we will be asking registering attendees to indicate if they would like to attend this also so that we may know the numbers for table booking. It is unlikely that we will be able to give financial assistance towards travel or accommodation expenses, but those whose abstracts are accepted are asked to keep their receipts in the event that this changes.